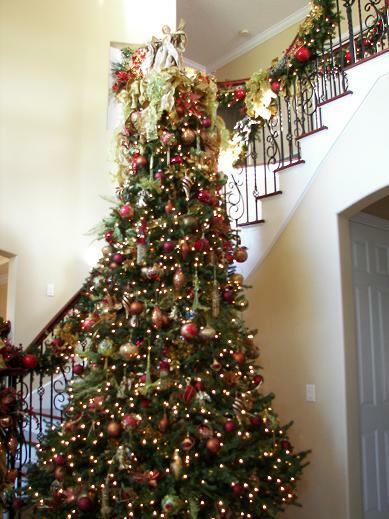 Whether it be a decorator Christmas Tree or your family Christmas Tree it’s all the same. In my more than 30 plus years of decorating the family Christmas Tree to today I have learned many tricks to make the best of your tree. It’s all about interest in ornaments and the textures, but foremost the lights. Lighting a tree is very important to have plenty of lights. I figure 100 lights per foot and add 300 to 500 additional lights. I like to light my own trees. Lighting a real or permanent tree the method is pretty much the same. Always work from the center of the tree. I always run 100-200 lights through the center of 8-9′ tree. This illuminates the center of the tree not to mention the ornaments we are going to add to the Christmas Tree. I then begin at the bottom of the tree wrapping the branches closely. I do mean every branch. Since I added the lights in the center first I don’t have to go as deep into the tree with the wrapping of the lights branch by branch. I repeat this process until I reach the top of the tree. Now it’s time to decorate.